A few shots from the launch in September '05. Bryon Schopp's airmail rocket on lift off. Another shot of Bryon Schopp's airmail rocket on lift off. Another shot of Charm, this time on a I285 redline. Dave Glass's Mad Maxine on a white lightning motor. Rich Maes foundling, delivered by our land owner Emerson Grafmiller. Lou Bragg's Arminius on a redline motor. Lou Bragg's Arminius on a white lightning motor this time. 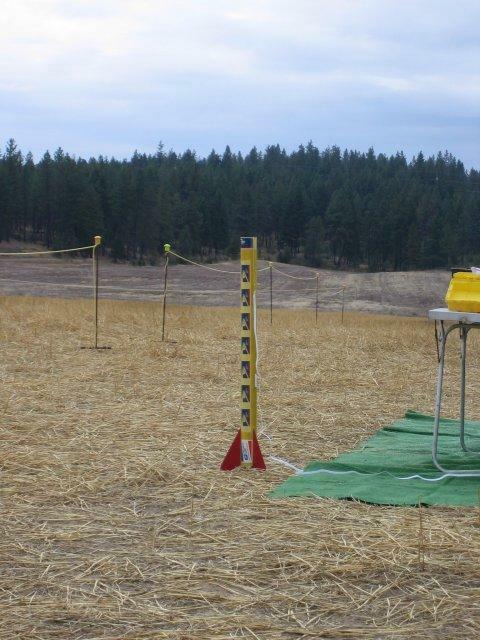 An Estes Max Trax on lift off. An unknown rocket on a smokey motor. An unknown rocket on a blue thunder motor. The request from Washington Aerospace to bring fire extinguishers to the Mansfield launch on October 22 and 23 was approved. Weed wackers and rakes should be brought to the October 8th SPARC launch to continue with launch site preparation. Some clearing of the high power pads is in order. The Mansfield launch is to be held on the 22nd and 23rd of October. The plan is to fly the club project on one of those dates. The plan is also to have a preparation "party" to have the bird fully ready to go upon arrival at Mansfield. Charges and igniters are already built, but need to be installed. Recovery system needs to be packed for flight. Motors are assembled, but closures need to be tightened and motors installed for flight. The Club launch hotline is inactive, or non-functional, the idea of a pay as you go cell phone as the club launch hotline was proposed. Ray Stoner will determine the cost of doing this and report back at the next meeting. Benefits of the pay as you go system are; no monthly fees, you only pay for the minutes you use, a voice message can be updated via a regular land line to provide updates on an ongoing basis, and it can be carried to the launch site on launch days so that people can talk to a live person to determine if there is a launch taking place. Collected launch fees and donations amount to $12.31 for the September launch. Port-a-potty fees have not arrived, but are expected. I thought I would get this out, even if it is very, very late. Computer crash and rebuild have delayed things somewhat. I arrived on site to find the trailer, Bill Munds and Bryon Schopp and his wife, Debbie, on site already. I was late, so I was surprised to find so few people there. It was a harbinger of things to come. Setup proceeded after Bob arrived with the keys to the trailer. We started flying slightly before noon. There were some great flights on Saturday, but the crowd was never very large. Only 38 total flights. Bob Yanecek flying Kluge and ~almost~ losing it. Not many of the usualls showed up for the launch, but there were several new faces. Several of the Whitworth physics class students were at the launch, and their professor was there too. Emerson showed up mid afternoon carrying a foundling from WheatChex, Rich Maes was happy to get his rocket back. Only four people stayed the night. Bill Munds, Myself, Bryon Shopp and his wife Debbie (right?). Sunday dawned bright and clear with some light winds. Flying got started around 9 with some models and then the people started to show up. There were more people on Sunday, but not as many as I would have expected to show up on such a beautiful flying day. Lou Bragg and Bryon Schopp keeping the pads full all day. Nick and Steve Ramberg showing up later in the day and flying a BUNCH in a short time. Steve Ramberg getting his Level 1 cert. Congratulations! Dave Glass' Son of Sam and then flying his A3 at the end of the day after pulling LCO duty for most of the day! BIG THANKS to Dave! Marty Weiser flying Lucky Man his two stage bird on a J570 to a I211, great flight! As I said before, Sunday had a lot more people, many new faces that I think will become active members of the club. All in all a good launch considering the low attendance. I got to fly 3 models and 4 high power flights, a good launch for me. Next launch is the 8th of October!